Are you tired of feeling tired? Do you regularly wake up feeling rather lethargic and unenergized of a morning? Perhaps you skip breakfast in exchange for an extra 15 minutes, snoozing in bed (which of course, flies by in an instant), which invariably leaves you feeling sluggish for the rest of the day. As much as you might hate to admit it, your diet likely has a great deal to do with the way you feel on your average day to day. What many people don’t realise is that the key to a healthy lifestyle is actually in the kitchen. If you’ve been feeling quite down and you’re not feeling particularly good about yourself then it’s time to start eating better! The trouble is…if your kitchen is in bad shape, doesn’t function well and just makes you feel pretty darn depressed whenever you enter; you’re not going to feel too inspired to cook. This is why we believe that having a new modern kitchen design can help you to launch a healthy lifestyle. One of the easiest ways to encourage new habits is by introducing drastic change. 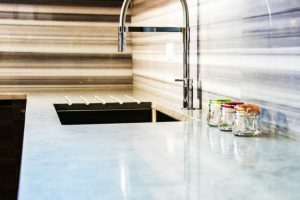 Imagine stripping your current kitchen down completely and then replacing it with a brand-new, fully functioning, spacious kitchen, fitted with some quality new appliances? You’ll be buzzing about waking up in the morning and preparing a healthy smoothie to start your day. You’ll feel great about trying out some new recipes and inviting your friends over for dinner! You’ll have everything you need to start working towards a happier, healthier you. And you might think that the idea of buying a new kitchen in order to live a healthier life is ridiculous, but it works! 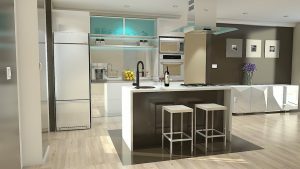 It works because a new kitchen is no small investment and it takes a lot of planning and careful consideration. If you invest in a new kitchen for the sake of wanting to spend more time in there; you will invariably do so. You’ll be excited to try your hand at cooking and learning new life skills and you’ll feel even better about eating quality, home-cooked foods. But it’s not just about you. If you’ve got children and you’ve been resorting to take-outs and microwave meals because you can’t stand being in your kitchen, then you’re not doing your family any favours either. Of course, there’s no harm in the occasional take out, but you should endeavour to cook as many nutritious, home-cooked meals as you can. You’ll even find that you end up saving money in the long run! And even if you’re not the most experienced of chefs, it doesn’t mean that you’ll be unable to whip up some delicious, healthy meals for you and yours. In fact, there are plenty of easy recipes that anyone can do! So, what are you waiting for? Start planning your kitchen renovation today!